It was Halloween and ghosts, goblins, dragons and other assorted fantastical creations were scurrying up and down the corridors adjusting buttons, zips and dry ice. Dry ice? Yes, dry ice billowing out of a dragon’s pointy tail, trailing my friend and colleague down the dormitory hallway on her way to the annual Halloween Ball at McMurdo Station, Antarctica. Residents of MacTown, as it is affectionately (and sometimes not so affectionately) called, revel in the opportunity to let off steam (or dry ice! ), forget the stress of 12-hour workdays, 6-days a week, the isolation, the separation from family and friends, the COLD. The American research stations of Antarctica have a notable density of creative talent and fascinating personalities. This Halloween night, the HazMat twins, two colleagues from the science laboratory, were in particularly fine form; their bodies enveloped in giant yellow bags, the kind used to dispose of hazardous materials, a spider crawling over a false pop-eye and the twin with a rubber balloon face, inflated and deflated with a hidden tube. Then there were mummies and clowns and me. I don’t know what I was; my hair was partially blue, skeletons hung from my ears and I put on the tie-dye dress I wore every Halloween. Ok, so I’m not so creative, at least when it comes to Halloween. Poking my head into my neighbors’ rooms, I saw faces being painted, eyebrows blackened, beards shaved and costumes adjusted. Laughter and loud music permeated the building. Primped and primed for fun, we trundled over to the gym to start the evening’s revelry. There was dancing and drinking and a live band of contract workers, surprisingly skilled, playing rock and roll music. Lights flashed, monsters and mummies girated and beer flowed. Scientists mingled with plumbers, Navy with civilians, managers with general laborers. You really couldn’t tell who was who, anyways. Tomorrow it would be ‘back to work’ and back to the usual hierarchy of the workforce. When I wasn’t a blue-haired hippy, I ordered, tracked, distributed, maintained and recycled materials for the science laboratory and one particular biologist had caught my eye. But, sadly, I was a shrinking violet, a wallflower, bashful beyond belief. However, as the night wore on, I migrated to one of the several bars on base and spotted HIM. We both enjoyed what was probably an excessive amount of liquid nourishment which led to a significant degradation in social graces. By the time I finally took note of my surroundings, the bar was empty, except for the two of us. Common sense being long forgotten, we decided that it would be a brilliant idea to visit a fish hut out on the sea ice. Fish huts are very small structures, a roof and four walls with a door and no floor, set up over a hole in the ice. They provide a degree of protection from the elements, which as you can imagine, can be quite harsh, while scientists collect fish or other sea creatures from under the ice for their research. 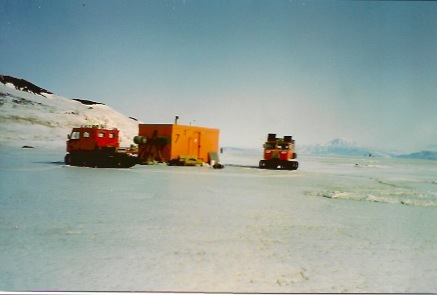 First we had to find an available vehicle, called a spryte, with tracks instead of wheels, drive ourselves out onto the sea ice and follow a flagged route to the hut. I was not authorized to do this, but, as previously indicated, common sense was not a deterrent. I threw on my giant red official parka over my tie-dye dress, pulled on some heavy pants and bunny boots. No, not those slippers with bunny ears. These look more like giant, white rubber Mickey Mouse shoes. They’re designed to trap air around your foot, which, in theory, keeps them warm; and they probably do work for most people. I, however, have dysfunctional feet, cold at all temperatures below 50 degrees fahrenheit, regardless of footwear, and there, in the coldest of places on earth, it was always below 50 degrees and usually below freezing–way below. The air that night, more than twenty long years ago, was dry and crisp, the sky overcast, the light subdued; the night darkness not to return until April. Our spryte thumped and bumped over the rough ice road on the way to the hut. It was in the wee hours of the morning that we arrived, our workday to begin in short time, but until then we crept into a feathery down sleeping bag, our toes close to the gaping fish hole. I awoke to a soft snorting and the sound of moving water, then silence. My imagination, most likely. Another snort, a heavy breath and no, that wasn’t my imagination. I peaked out over the edge of my bag and into the soft, lashed eyes of a Weddell seal, sucking in the night air next to my toes. Unperturbed by our presence, he popped up several times during those early morning hours, perhaps just to take a breath or perhaps to take a curious look at the humans in the fluffy cocoon. Morning brought storm clouds and whiteout conditions. I risked trouble, or worse, if I didn’t get back to base safely and unseen. Unseen wouldn’t be too difficult considering the weather, but safely could be tricky. Once in the spryte and on the road, the flags were visible, one at a time and, making slow progress, we returned to base and parted ways; sobriety and reality dampening the romance of the night before. I felt more than a little foolish stumbling back to the dorm in those early hours, washing my blue hair and taking off my skeleton earrings and tie-dye dress to prepare for the workday. But Halloween night, 1991, will always be a magical memory of an icy white wilderness at the bottom of the world, perched on a thick layer of frozen sea, the frigid water below teaming with life and a lone seal that came to touch my toes. I am an American citizen, born in Tucson, Arizona but raised in Vancouver, Canada (my father was from Edmonton). I’ve traveled to all seven continents, including Antarctica where I met my Italian scientist husband. After leaving job, family and friends in Colorado, I came to Rome to be with my Roman. Now we live in a small town southeast of the capital with our four children, three dogs, four cats and two turtles. And that’s another story!